An early contender for goal of the tournament has proved enough to give New Zealand a winning start at the FIFA U-17 Women’s World Cup in Uruguay, as Leon Birnie’s side earned a well-deserved 1-0 win over Finland this morning. Tournament debutants Finland enjoyed much of the possession at the Estadio Charrúa in Montevideo but struggled to break down a superbly-organised New Zealand defence while the Kiwis had by far the better of the chances. Indeed, had it not been for a heroic performance from Finnish goalkeeper Anna Koivunen, who pulled off several outstanding saves to keep her side in the game, the winning margin would have been even higher. But she wasn’t able to keep out a stunning effort just before the break from Brown, who unleashed a perfectly-placed strike from long distance that Koivunen got a hand to but couldn’t prevent falling into the net. It proved to be the decisive moment of the match and the victory was a fitting reward for the efforts of Birnie’s charges. “It was a great performance, we’d watched a lot of footage in the qualifiers and Finland are a very, very good side. They’ve had some great results and we knew this was going to be real challenge,” he said. It was just the third ever victory for New Zealand at this event, going down alongside a 3-1 win against Colombia on home soil in 2008 – in which a fresh-faced Rosie White struck a hat-trick – and an equally-memorable 5-0 triumph over Jordan in 2016, Hannah Blake scoring a hat-trick on that occasion while Samantha Tawharu got the other two. Due to the impressive exploits of Koivunen, there weren’t as many goals today but Birnie won’t care as, with further Group A matches against hosts Uruguay and Ghana to come, his team is now promisingly placed to progress to the knockout stages. “We had two goals when we came over here, one was to get a win and the second was to get out of the group, so we’re halfway there,” he said. 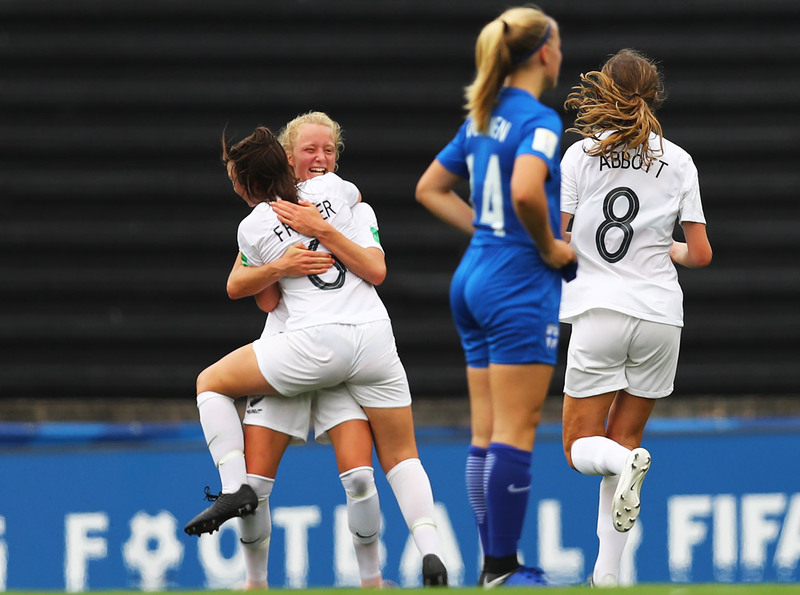 In the opening stages of today’s match, Finland looked to impose their possession-based style and it wasn’t until midway through the half that New Zealand had their first sight of goal, Amelia Abbott drawing the game’s first top-class save from Koivunen with a long-range effort. That resulted in a concerted spell of pressure from Birnie’s side but they weren’t able to get their noses in front until Brown’s stunning intervention in the 41st minute. At the other end, goalkeeper Anna Leat did not have much to do as captain Aneka Mittendorff led a strong rearguard effort and that trend continued in the second half as Finland managed to get only one shot on target. Koivunen was far busier than her Kiwi counterpart, making a string of athletic saves to deny Maggie Jenkins and Grace Wisnewski as New Zealand tried to extend their lead. Jenkins, who has one cap for the senior Football Ferns, was particularly unlucky not to get on the scoresheet as both her efforts were very well-struck. Also putting in an impressive display was Gabi Rennie, whose pace down the right caused regular problems for the Finland defence. New Zealand take on their hosts Uruguay in their second match of the FIFA U-17 Women’s World Cup.